Sensual, elegant and contemporary... Discover Violette Divine! An Eau de Parfum adorned with precious colors: Gold for excellence, Black for mystery and Purple for elegance. An irresistible weapon of seduction presented as "a daring declaration of glamour, sensuality and prestige". An intense, powerful and sensual Eau de Parfum... The fragrance opens with sensuous notes of Mandarin. A majestuous [sic] atmosphere then unfolds... from its heart emanate refined accords of Violet and Cedar. Finally, the suave notes of Sandalwood reveal all the elegance and romanticism of this fragrance. They had me at ‘majestuous’. I was all like, ‘say no more’! But then they had to go ahead and add ‘suave’ sandalwood. I mean, who can resist? Kidding aside – sounds like it could be very nice. This doesn’t grab me, but then, I’m fickle about violet. The packaging is gorgeous, though. I am not a fan of the original Violettes de Toulouse (I’m a Borsari girl) but lots of people love it. The outer box is fabulous — I want one! V da Parma was one of the first niche samples I ever smelled, so it has a nostalgic place in my heart. So, R, I assume you don’t find them similar? Any way to compare in ten words or fewer? Well, yes, similar. The Berdoues is sweeter, darker, more old-fashioned. Touch of mustiness that reminds me of the original formula of Caron Violette Precieuse. The Borsari is a simpler scent. Bear in mind that I haven’t smelled new versions of either, & they’ve got to have been redone by now I should think. Why do companies continue to use that pump thingy? I’m sure they all know by now they leak and you have to spray double! Hopefully it’s optional? Hard to tell if it’s crimped on there or not. Agree though, I won’t buy bulb atomizers. Sigh…. I`m hopelessly sold, both to this newbie and her older sisters! (I`ve 2 sizes of the original bought in the 70`s from Caswell-Massey – the purchase power of allowance $$$! ) I just can`t say `no` to these enchanting flowers! Hope you’ll like them then! Violet is not my favorite note…..but I’m with Kitty—love the packaging! Oh I love violets. How’d I miss this series? I love Borsari in the spring, but also Violetta di Bosco in the colder months, so the Berdoues sounds lovely. Does anyone know how many violet frags are in this series? I’ve never heard of them until now. 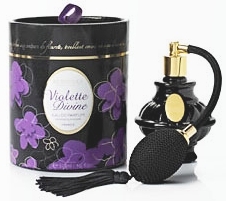 Violettes de Toulouse is a very old fragrances, then there are the 2 newer ones. As Joe said, click on the link! Click on the “Berdoues” link in Robin’s announcement paragraph and it’ll take you to information about the house and a link to the company website. Looks like this is the third that’s actually in production. I’m liking the packaging over on their website.